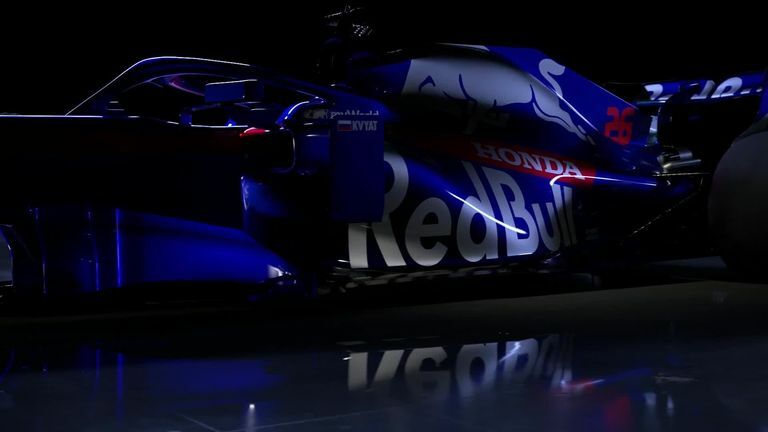 Toro Rosso revealed their new Honda-powered STR14 on Monday ahead of the 2019 F1 season. Toro Rosso have released the first images of their 2019 car to kick off Formula 1's eagerly-anticipated 'launch week'. The STR14 is the second Honda-powered car the team have produced, and features a similar livery design to last year's challenger. And team boss Franz Tost said: "All things considered, the quality of the synergies with Red Bull Technology, the belief in our very high level of in-house technical knowledge, the impressive development trajectory Honda has shown so far, and the couple of strong young drivers we have available make me feel confident." The new Toro Rosso car features 2019's biggest two design changes aimed at improving overtaking - a wider and simplified front wing, and higher rear wing. By the end of this week nine of F1's 10 teams will have either revealed their all-new car in full, or their 2019 livery, ahead of the start of winter testing at Barcelona next Monday. What's changed at Toro Rosso? Daniil Kvyat returns for his third spell at Toro Rosso following a year away from F1, while the British-born Alexander Albon, who was also previously axed from the Red Bull programme, is ready for his rookie season in the sport. What's new on the 2019 F1 cars? Why it's new rules, new cars and new possibilities for closer racing this season. "We don't know exactly where we're going to be," said Kvyat. "I believe in the guys in the team. They know what they're doing. Me and my engineering crew will do everything we can to squeeze the maximum out of the package we're given by the team. I think we're looking good and I feel that everyone is motivated and focused. I can see that, and it gives me confidence for the future." The Red Bull junior team endured one of their worst seasons in F1 last year, finishing ninth and only ahead of Williams after an inconsistent start to life with Honda engines. Red Bull were suitably impressed, following Toro Rosso's lead in switching Renault for Honda power. Honda chief Toyoharu Tanabe said: "In simple terms, our aim is to achieve better results than in 2018 for both teams. For our partnership with Toro Rosso, that means finishing higher up in the Constructors' Championship, scoring more points, running more reliably and, maybe even repeating last year's Bahrain result or doing better." Kvyat and Albon replace Pierre Gasly, who has left for Red Bull, and Brendon Hartley, dropped after a disappointing year. What's new on the 2019 cars? Also on the move is former technical director James Key, who was placed on gardening leave last July after agreeing to join McLaren in the same role. The Englishman is expected to start work at his new team later this year.